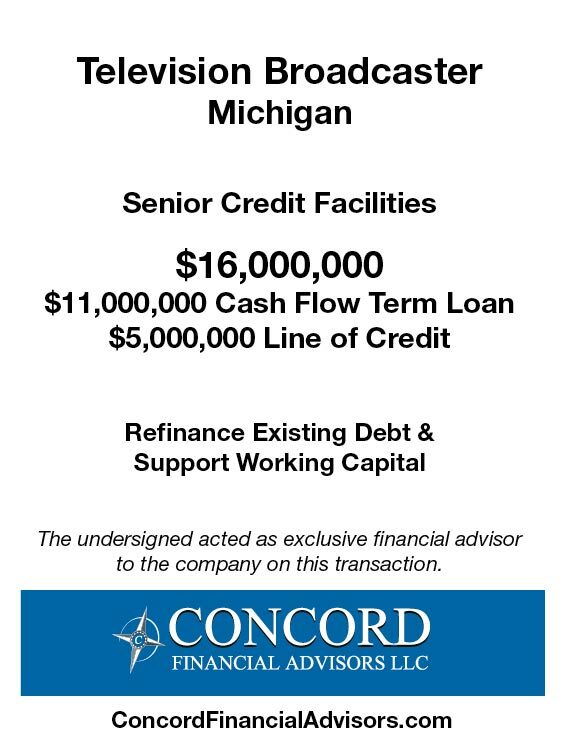 A Michigan based television broadcaster (CBS and FOX affiliates) is seeking to refinance its existing senior credit facilities. The company operates in a duopoly market and dominates the market with its local news coverage. Most recent FYE EBITDA is 3x preceding three year period. The incumbent lender decides to exit the market for single ownership broadcasters and the company needs to refinance its current credit facility. Concord prepares a detailed memorandum highlighting the company’s most recent FYE EBITDA performance, increasing contracted retransmission revenues, strong political advertising trends and experienced management team. Concord runs a targeted and efficient sales process to traditional commercial banks and mezzanine investors interested in the broadcasting space. Concord secures three commercial bank proposals and the company is not required to take on higher priced mezzanine financing. Concord negotiates the three commercial bank proposals and secures a very aggressive structure with below market pricing. Management is very pleased with the Concord process, the final structure of the deal and the pricing it provides.